One of people that I “follow” on Facebook is one of the food critics for our local county newspaper. A few months back, I saw that this person linked back to an article in the Food section of the paper that listed the Top 10 Restaurants in Orange County. For fun, I just thought I’d read through the article to see if I agreed with it, if I’d been to any of these restaurants, if I’d even heard of any of these restaurants, or if any of these restaurants were appealing enough to give a try. In going through the list, I was stunned to find that one of the restaurants on the list was a restaurant in a neighboring city to my hometown that I’d never heard of before. 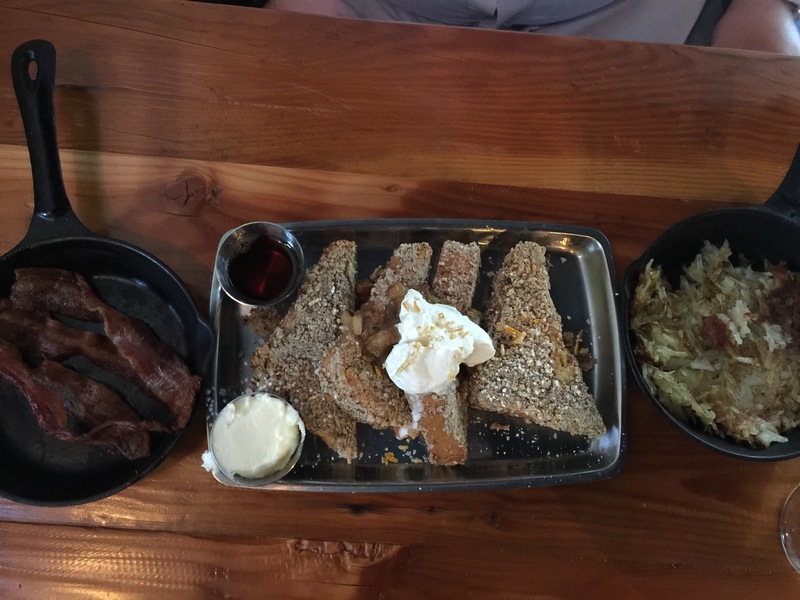 When I forwarded the list to my husband, he said we should make reservations for brunch for the upcoming weekend to give this new restaurant a try and see if it lives up to its reputation as one of the Top 10 Restaurants in Orange County. Salt & Ash is owned by a husband and wife duo who say that they make “real food for real people.” Having taken over a former Greek taverna, they’ve transformed the space using reclaimed wood, recycled products and brick and mortar accents to create a warm and inviting atmosphere where guests are to feel like they are being welcomed into the owner’s home in a casual and relaxed space. The menu is creative American fare featuring “hyper-local organic farmers, day boat fishermen, micro-brew masters and other small businesses,” featuring as much local Orange County product as possible. The food is made in-house, fresh from scratch using locally sourced, organic meats, cheese and poultry which is served farmed to table. The restaurant also features a full-service bar with both indoor and outdoor dining areas. The bar highlights local micro-brews with an ever-changing and rotating list of beers on tap. One of Salt & Ash’s motto’s is “love, food, drink, life” and that is demonstrated in some beautiful lighting fixtures that hang up inside the space that spell out the words “love,” “food,” “drink,” and “life.” While most of the interior walls are made with recycled wood and hanging candle sconces, there’s surprising a lot of natural light that streams into the space making it feel warm and inviting. The restaurant has an open kitchen front from which you can see the chefs working diligently to make customers orders as they are placed. To start off our “brunch” meal, which was really more like lunch, we placed a couple of drink orders. Being a non-drinker, I actually placed an order for a mocha chip milkshake. I’m a sucker for milkshakes and almost can’t resist them when I see them on any menu, be it at a restaurant or a fast food place. 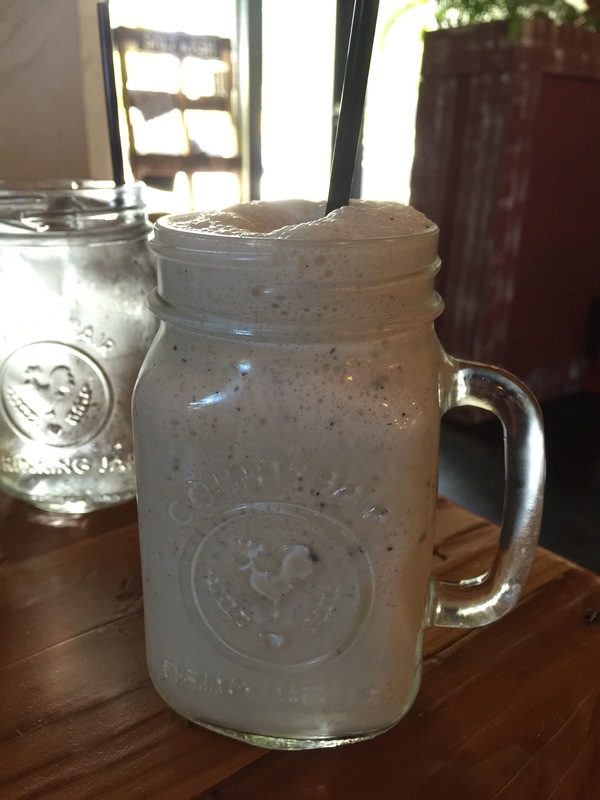 This mocha chip milkshake wasn’t super thick, but had a great mocha flavor, which I loved. Unfortunately, as with any sort of “chip” flavored ice cream, when you turn it into a milkshake, the chips don’t get blended fully and you end up with a pile of “chips” at the bottom of the drink as they settle there. My husband was intrigued with an ale that Salt & Ash had on tap from a local brewery in Orange called Valiant Brewery. We later found out that Valiant makes a lot of Belgian-style ales, which my husband really likes. 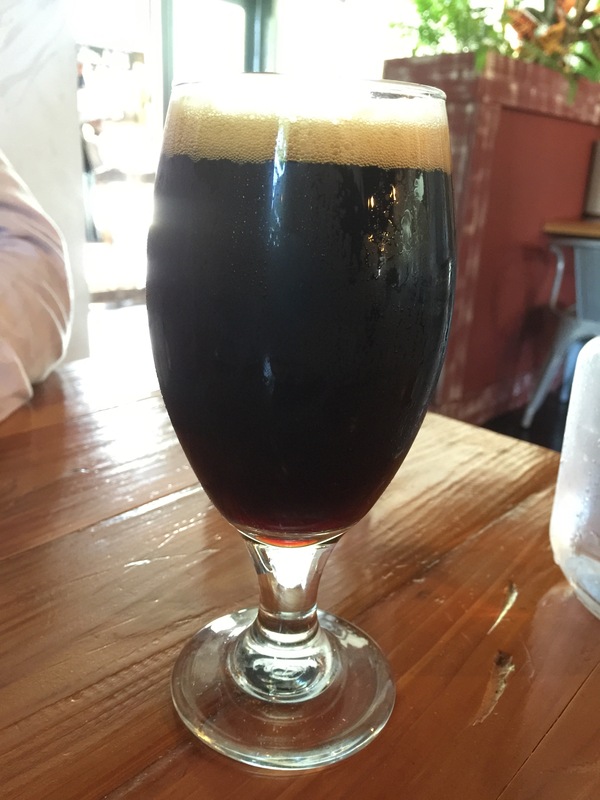 What my husband ordered was a seasonal fall ale called the Imperial Brown Coconut Ale. My husband really liked this beer since he could really taste the coconut and he said in all the beers he’s ever tried in his life, he’s never tasted coconut in a beer ever. In fact, a couple of months later, we dined at Salt & Ash again and my husband was really hoping they might still have this beer, and he was disappointed to find out that this was a seasonal fall beer and they didn’t have any more of it. We’ll have to see if they release it again this fall. As this was brunch, my husband, who loves breakfast-y food decided he wanted to order a breakfast item for his meal. To go with a side of bacon and a side of hash browns, my husband ordered the brioche French toast. The French toast was hazenlut crusted and served with a pear compote atop along with butter and warm maple syrup on the side with a dollop of fresh whipped cream on top. I was surprised that my husband passed up an eggs Benedict to order the French toast, which was definitely more something I would order than he would order. After slapping on some of the butter and drizzling the warm maple syrup over the French toast my husband took a bite and his taste buds sang. 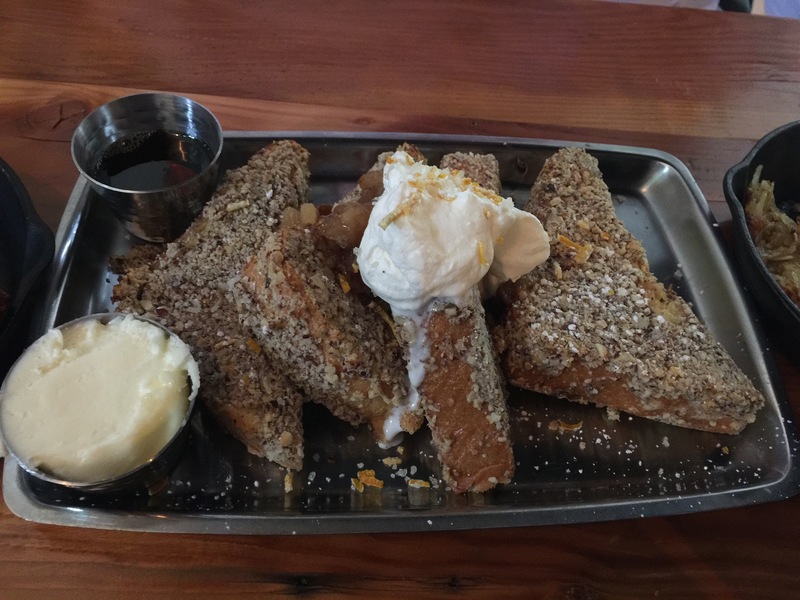 He immediately told me that this French toast was amazing, it was hearty and filling, but not too sweet and he enjoyed the crunch of the hazelnut crust. Surprisingly, he even liked the pear compote, which I thought for sure he wouldn’t like. In the end, he gave me a slice of the French toast since he told me that I should give it a try as he thought I would like it too. He was right, it was good and that hazelnut crust was much better than I thought it would be. It was crunchy and light and gave the French toast a slightly nutty flavor. As for the sides, the hash browns and the bacon, you can’t ever go wrong with your standard breakfast potatoes and meat. My husband was more than satisfied and full. I decided to go with a more hearty lunch item rather than a breakfast item. My order was the house blend burger with onion jam, aioli and aged white cheddar with a side of fries. I was hungry, but this burger was huge. In the end, I exchanged part of my burger with my husband for part of his French toast. First off, the pretzel bun that Salt & Ash uses for the burger is perfect. It sops up the juice from the burger, but without making the bun soggy and soft, which is something I hate. The bun had a nice pretzel taste that complemented the burger so well. The house blend burger patty was delicious, fatty and moist but full of rich, beef flavor. Topped with aged white cheddar which gave a hint of tang. The onion jam was much tastier than I thought it would be. The jam was chunky enough that you could tell you were eating onions rather than just a jam spread and it had a nice mild onion flavor. The aioli added the last level of flavor that the burger needed. The aioli added moistness to the burger and complemented the aged white cheddar well bringing the burger together to one cohesive dish. When I split the burger with my husband, he agreed that the burger was quite good as well. 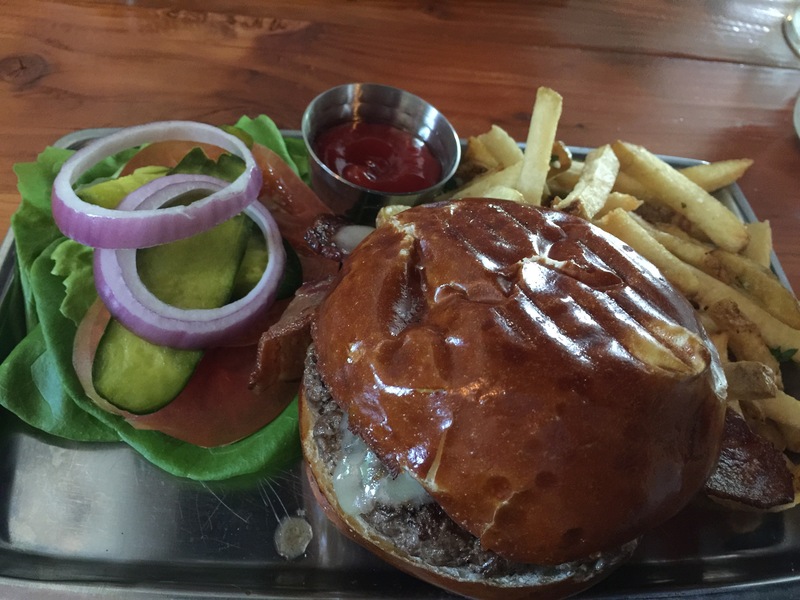 In fact, this burger is specifically mentioned in the article about the Top 10 Restaurants in Orange County article I read. So, it’s no wonder that we both enjoyed the burger. 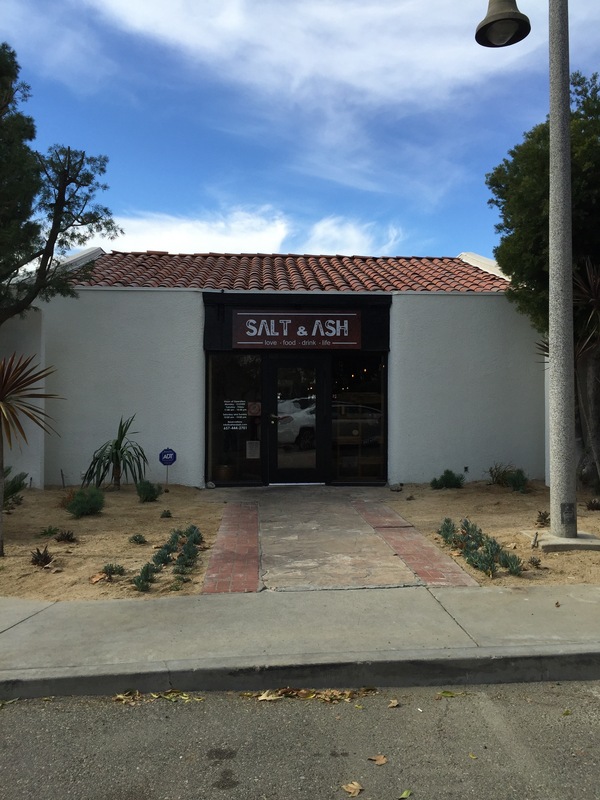 My husband and I were pleasantly surprised by Salt & Ash and how delicious their food was. We’d never expected to see a restaurant on the Top 10 list in our own backyard. We enjoyed it’s really relaxed and laid back atmosphere, so much so that my husband and I have returned to Salt & Ash for dinner, and my friends and I have come back for brunch. We love the fact that they really do make all of their food with care from scratch, and you can taste the care in every dish. When we returned for dinner, my husband ordered a pasta dish with homemade pasta noodles that he loved. And as a purveyor and supporter of local businesses, if you’re a fan of local craft beer, this is a wonderful place to come and taste and ever changing menu of local draft beer. 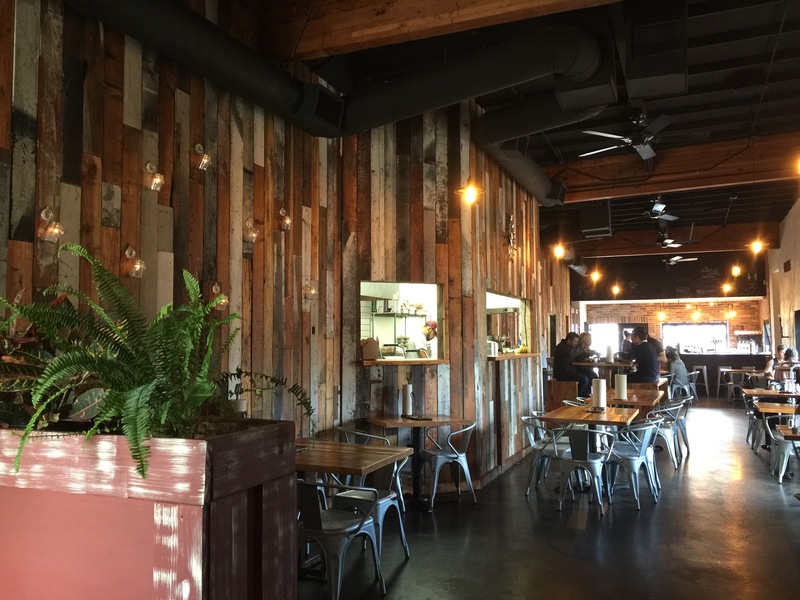 For a fun and relaxed brunch with friends or family or for a celebratory dinner meal, Salt & Ash is a terrific place to come, relax and enjoy some really good, local, fresh made American fare.